Daniel Balassone; Benjamin Swartzman, individually and on behalf of all others similarly situated v. Apple Inc., No. 5:12cv1384 PSG (N.D. Cal. [San Jose] filed Mar. 20, 2012). Class action for warranty and unfair competition. Defendant claims its iPhone 4S Siri feature, a voice-activated assistant, performs useful functions, such as making appointments and finding restaurants, and otherwise works as advertised. 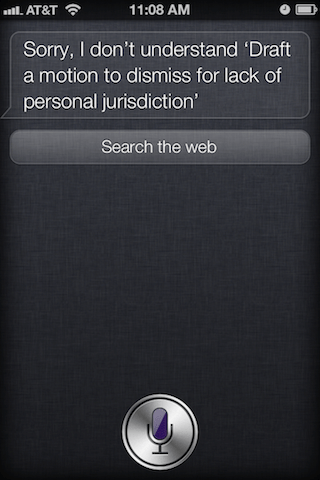 Siri does not perform as advertised, making the iPhone 4S merely a more expensive iPhone 4. At least this is more than just a cut-and-paste job based on the first lawsuit. That does sometimes happen as people rush to jump on the bandwagon; I've seen complaints where the prior plaintiff's name still appears in the complaint, because the lawyers just changed the names in the caption and didn't bother to proofread the thing before filing it. (Oops!) This is not one of those cases, but the allegations are basically the same as in Fazio. It's not impossible that this is entirely coincidental. Like Frank Fazio, Balassone and Swartzman may also have bought their phones based on Apple's alleged representations that Siri can do anything you ask her, "promptly realized" after the purchase that this is not in fact true, taken some time to investigate the matter and locate an attorney willing to assist them and all others similarly situated, and just happened to file about the same time that news broke of the first lawsuit. Could have happened. Or their lawyers may have seen the news and recruited the first couple of yokels who came walking by their office. (In Silicon Valley, even the yokels have the latest iPhone.) Only time will tell. I did read the complaint and asked Siri all the questions that Balassone and Swartzmen allege she screwed up for them, except for the questions involving their personal data, of course. She answered them all correctly for me, but maybe she just likes me better.